In what is probably the last act of his current position as Minister for SEND in this parliament, Ed Timpson has announced a much-awaited accountability framework for the new SEND reforms. Hold on, do I hear you ask? Why wasn't this announced last year when the reforms were implemented? Don't be silly, that would be far too logical and would have given a very important message to local authorities - do it right from the start or else you'll be held accountable. Instead, far too many LAs merrily went their own way, making their own policies to fit their own ideas. This meant the DfE's sparse band of SEN Advisors (or "Dementors" as we have dubbed them here at SNJ) had to to emerge from a damp chill of fog and swoop in to SEN departments to rap knuckles kindly show them where they were going wrong. Actually the reality is that they are regionally-assigned experienced SEN professionals who work across a number of LAs each to help ensure the DfE's vision is implemented. How do they find out about issues? If you have one, their advice is to complain to the LA itself first so they have a chance to shape up, then if no joy, speak to your local IASS service (formerly Parent Partnership) who are supposed to help you sort it out and presumably they will alert the SEN advisor if needed to do some "education" with the local authority. Don't forget there is also the local Disagreement Resolution service and you should be given all this information CLEARLY by the LA at the start of the process. IPSEA's site has lots of information on it about legal process. It seems this is the only way to seek accountability for now, until the Accountability Framework is in place. What have your experiences been? Good or bad, we want to know. The reforms had deliberately been light on prescription, intending to allow imaginations to flow and innovation in SEND to shine. This is fine, but in a new system, some parameters and guidance are needed to ensure you end up with what you hoped for. A raft of information was released yesterday from the DfE, (which we will look at more in days to come), almost as if an election was about to be called or something and they needed to chuck it all out there, before the politicians cleared out and scurried back to their constituencies, praying they get to come back again in a few months and hopefully on the smug side of the House of Commons. As to who will be the next Minister for all things SEN, we will just have to cross our fingers and hope that, if it isn't Mr Timpson, it'll be someone who is clearly as committed as he is to improving the lot of our families. Special Needs Jungle is not a politically partisan blog. We just want whoever is in the big chair to do the right thing. And whether we like Mr Timpson's politics or not, we do like him as an individual and recognise that his heart has been in the right place, even if his vision has been a little more utopian than the real world as we know it actually is. What does the Accountability Policy say? There wasn't really anything particularly new in the document per se, but it added meat onto the bones of information that had previously been released, such as education inspection body, Ofsted's role in judging how successful LAs have been in working with the new system - and, I'm told, that includes attitudes. Ofsted then, along with the Care Quality Commission for the health and social care aspects is where the services will be held to account. After the election dust settles (I assume), there is to be a public consultation on how Ofsted should inspect the way local authorities are succeeding at the reforms. This presumes that whoever's in the political driving seat then still thinks it's a good idea. ACTION ALERT: This will be YOUR chance to say how you want the reforms to be judged, so make sure you take it. Of course, come the time, we will have full details here so you know how to put your views forward, whatever they are. These consultations aren't just for organisations or groups - they're for everyone to have their say and that includes parents and young people. "The framework has three parts, which, when they work together, provide the structure for improving outcomes and experiences for children, young people and their families. It will show how the system is performing, hold partners to account and support self-improvement. The three parts are: local roles and responsibilities; national roles and responsibilities; and independent assessment." The Framework document came with a handy Venn diagram to explain the basis of the policy and I've clipped it here for you. 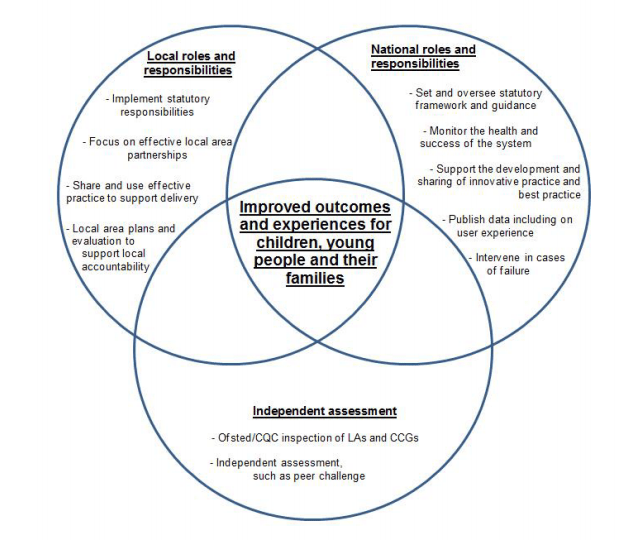 To explain, the central bit is what all three areas should achieve and the outer circle segments are a breakdown of the three areas - Local (LAs, schools, colleges), National (DfE, NHS and strategic partners such as the Council for Disabled Children) and Independent assessment (Ofsted and the Care Quality Commission). "We will work with local areas and partners to test these indicators and how well they support local accountability. We will also explore opportunities, through further analysis of national datasets, to understand better the wide range of performance and outcomes from different cohorts of children and young people." I am concerned that the last bit feels a bit it's like using children and young people with SEND as a research experiment. How long will this process take? What if the data that comes out is dismal? Of course if it is bad, it will mean something will be done to improve it, but we're not talking about abstract facts, we're talking about vulnerable young people who need the best of good practice, where everyone fulfils their roles as they are supposed to, and who need it right now. Of course, this is why the system for accountability should have been the first thing that was considered in these reforms - what do we want to achieve and how are we going to ensure that happens? The document says that there are plans for a national survey of "users’ satisfaction" underway. I'm assuming that families are the "users" referred to here. The intention is for survey results to be available in summer 2016 and these will enable, "local area benchmarking on a range of measures against national results". This is more than a year away. The document has separated out the accountability structures further and I'm just copying the table below, but with some added bits for clarity. I'm doing this because it names some key organisations and terms you need to know about and I'm adding links to their websites and also where you can find out more about the acronyms (such as CCG, JSNA etc) if you want to read further. If you have any questions about anything, let us know in the comments and we will try to find out the answers for you if we can. Local Authority Lead Member for Children’s Services (a local councillor) and Director for Children’s Services (the top LA staff member in the council for everything to do with children) are responsible for leading integration (education with health and social care) arrangements for Children and Young People with SEN or disabilities.Children’s and adult social care services MUST co-operate with those leading the integration arrangements for children and young people with SEN or disabilities to ensure the delivery of care and support is effectively integrated in the new SEN system for children and young people aged 0- 25. Wellbeing Board Membership of the Health and Wellbeing Board must include at least one local elected councillor, as well as a representative of the local Healthwatch organisation. It must also include the local DCS (as above), Director of Adult Social Services (DASS), and a senior CCG (Clinical Commissioning Group - i.e the body that runs your local health services) representative and the (local) Director of Public Health.The Health and Wellbeing Board must ensure a joint strategic needs assessment (JSNA) of the current and future needs of the whole local population is developed. The JSNA will form the basis of NHS and local authorities’ own commissioning plans, across health, social care, public health and children’s services. This is likely to include specific needs of children and young people with SEN or disabilities. Group The CCG governing body and Accountable Officer have a responsibility to co-operate with the local authority in jointly commissioning services, ensuring there is sufficient capacity contracted to deliver necessary services, drawing the attention of the local authority to groups and individual children and young people with SEN or disabilities, supporting diagnosis and assessment, and delivering interventions and review.CCGs will be held to account by NHS England and locally to the Health and Wellbeing Board for how well they contribute to delivering the local Health and Wellbeing Strategy. NHS England The Secretary of State for Health (whoever that will be) is responsible for NHS England who commissions specialist services which need to be reflected in local joint commissioning arrangements (for example augmentative and alternative communication systems, or provision for detained children and young people in relevant youth accommodation). Healthwatch Local Healthwatch organisations represent the voice of people, who use health and social care, on the Health and Wellbeing Board. They are independent, but funded by local authorities. Local Healthwatch organisations are a key mechanism for enabling people to share their views and concerns – to ensure that commissioners have a clear picture of local communities’ needs and that this is represented in the planning and delivery of local services. This can include supporting children and young people with SEN or disabilities. academies) The governing body and school leaders are responsible in mainstream schools and have duties to use best endeavours to make the provision required to meet the Special Educational Needs of children and young people. All schools must publish details of what SEN provision is available through an information report and co-operate with the local authority in drawing up and reviewing the Local Offer.Schools also have duties to make reasonable adjustments for disabled children and young people, to support with medical conditions and to inform parents and young people when SEN provision is made. More information about the role of early years settings, schools and post-16 institutions is given in Chapters 5 to 7 of the Code of Practice. Accountability is through Ofsted and the annual report that schools have to provide to parents on their children’s progress. Colleges The governing body and college leaders are responsible in mainstream colleges and have duties to use best endeavours to make the provision required to meet the SEN of children and young people.Mainstream and special colleges must also co-operate with the local authority in drawing up and reviewing the Local Offer. Source: Based on the SEND Code of Practice: 0 to 25 years (This means it isn't really new information but it has been explained better than it was in the Code of Practice. Hopefully the CoP will be updated to reflect this better explanation after the election. Why wasn't this framework integral to the Children and Families Act and SEND Code of Practice and ready to go on Sept 1st 2014, as it is one of the most important pieces of the reforms? Surely having it published at the outset would have shown LAs that there is a framework that they need to follow - it could have always been updated to reflect implementation learning. I do not think this question will ever be answered because the only answer is, "Hindsight is a wonderful thing." Some families who have been going through the transfer or who are new entrants, have been subjected to poor practice and misinformation, staff poorly trained in the new system who have no concept of culture change. I understand that this is a new system and there will be teething troubles but these difficulties might have been less prevalent if it hadn't been rushed through like a steam train that wasn't stopping for anything. In my and many others' view, the political imperative trumped a smooth transition. I do believe that everyone, including those in local authorities wants to do, "the right thing". But there is only one right thing and that is that everything that is done, every change that is made should be done with due consideration to the effects and knock-on effects it will have on those it directly affects. Would this process have taken longer? Of course. But the lives and futures of children should NEVER come second to politics and politicians entering the Department for Education should have this stamped on the back of their hands every day by those nice security people in the foyer at Sanctuary Buildings before they are allowed in the door. Any moment now (like maybe today) parliament will be prorogued. That means broken up for the election. Finito. Ciao. Sayonara. Five years of Coalition government will come to an end and we don't know what will come next. That's up to us in the secrecy of the ballot booth. But the question that remains is, what happens if the next government is a different hue and the incoming party wants something different? So, is this enough to answer your questions about accountability or would you like to see it spelled out more? What have your experiences been like? Have you seen positive changes? If you're a new entrant to the SEND system, have you had a good experience? We want to not only identify poor practice but highlight those LAs who have taken the reforms to heart, writing about what they have done well so others can follow. Tell us your best and worst and what you think of the accountability policy so far. Not impressed with the framework document. Could have used info from the SEND tribunal much more – number of appeals is a very blunt measure and doesn’t particularly illuminate LA misbehaviour. No mention of the Local Government Ombudsman either. It feels like Government is being very selective as to who it wants to listen to. Generally speaking, we already know who’s accountable for which bits. That’s not the issue. The issue is how will these organisations be held to account in practice, and what will the consequences be when they fail to meet their obligations? I don’t have any faith in the ability of a troika of Ofsted, CQC and LA inspectors to hold these organisations to account. At best, Ofsted’s expertise in SEN is patchy; at worst, it is embarrassingly poor. You would not believe how little training Ofsted inspectors get in SEN issues – even the inspectors approved to inspect SEND provision appear to have had little more than an hour’s PowerPoint training on the new SENCOP. The idea of these inspectors using crude tools like RAISEOnline to assess whether kids with SEN are getting the right support fills me with dread. There’s also a risk that some Ofsted inspectors will also continue to double up as education consultants to LAs – can we really trust inspectors with cosy consultancy sidelines to inspect LAs without fear or favour? And whilst we’re on the subject of conflicts of interest, why on earth is there an LA rep taking part in the inspection process at all? A lot of parents with SEN I know didn’t have a problem with the old legislation. What they had a problem with was LAs blithely ignoring their legal obligations. I can’t see how this is going to change any of that in practice. My youngest’s best mate is in Year 6. His LA has just issued his final amended statement – six weeks after the statutory deadllne, completely unlawfully. Their chances of getting a SENDIST appeal date before September are now very, very slim. And the LA knew this. Just business as usual. No comeback, no consequences, just the usual unaccountable behaviour. You might as well chastise a dog for chewing its own testicles. Will any of this new framework change the way accountable organisations behave in practice? I’d love to think so. But I can’t see it happening in the timeframe that my kids will be in school – and probably not for their kids, either. Hi, thanks for your really valuable comment- did you get cut off before you’d finished? here is a perfect arms length model the government put in place in 2011 to sort similar accountability on health and care delivery. They set up local Healthwatch agencies (paid staff supported by service users and volunteers. – some real powers to make health and social care accountable. Works alongside the CQC regulator and health ombudsman. This model really works and an education sen could run in parallel without huge cost in setting up brand new structures. It really is make social care delivered by the council and providers accountable. It is creating a raft of case studies, research and evidence when people like the ministers need it to form policy. What it also did was focus all the health fraternity in the community into a more structured reporting and accountable model. It has a clear form of governance on all levels and is formally invited to attend key LA and CCG commissioning meetings and influence I=them for the good of its members and service users and the general public. Having been involved in Healthwatch then this model devised by parliament as part of the health monitoring framework is as good as it gets. it is basically an elected board from an independent/subject interest group formed from third sector organisations or individuals. A paid chair runs the board and the strategic work plan. On one side of the board model the chair and vice chair sit on all the strategic health and commissioning groups and feed views in. On the other side of the board is a paid group of staff who do the work stemming from work plans. They gather views/evidence best and worst practice for adoption. This model has local accountability and really does hold commissioners and providers to account. It could be tweaked with a little more cash injection to create an education watch type model. All the many groups such as various disability groups/parent carer groups would be united under this and the beauty is if it runs in parallel to the health watch board then the health and social care issues that run alongside education issues could be passed over. All it needs is a tweak to have an education workstream and a health and social care workstream with a single board accountable. A cash injection to expand the board model and staff would see an effective and life changing model created which covers all bases and has ground level buy in as we would see the point of engaging as we would have a focus for our issues. In light of cutbacks to LA services, the likes of which we’ve never experienced before, I find it hard to believe that LAs will be genuinely held accountable for practice which goes against guidance/statutory obligations. LAs, in my experience, know all about shortcuts/loopholes and will continue to use these whenever they can. Parents of SEN children hardly have time to wipe their noses, let alone challenge their LAs by taking them to tribunal to challenge malpractice. Yet again I feel it will be the savvy/able parents who have the time and money to really hold these organisations to account. I don’t believe the new framework will particularly improve the situation, sadly. I would absolutely love to eat my words a few years down the line. “In addition I would like to offer, on behalf of the Council, an unreserved apology for the failure to issue your daughter’s Education Health & Care Plan within the 14 week statutory limit”. So no, this accountability structure, no good without teeth.